Indonesia should really be called the land of plentiful water. Or food. And motorcycles. While I’ve yet to see any threatening reptile, I have seen many rivers and experienced the dreaded kamar mandi, or bathroom, which include the squat toilet and bucket baths. It is deceiving to say that a mandi, or what is best translated as bucket bath, is as bad as it sounds. When I first heard of bucket baths, I envisioned fetching water from a river for daily use. My home has running water and on the contrary, a kamar mandi (in my case) is a large wet room with water constantly flowing through it. There are two large containers that are continually filled with water from faucets that can be turned on or off. If the containers overflow, the water just spills over draining out a large drain on the floor. In Indonesia, particularly Batu—the region I’m in—people are so confident on the abundance of their water that they don’t even bother to turn the faucets off. 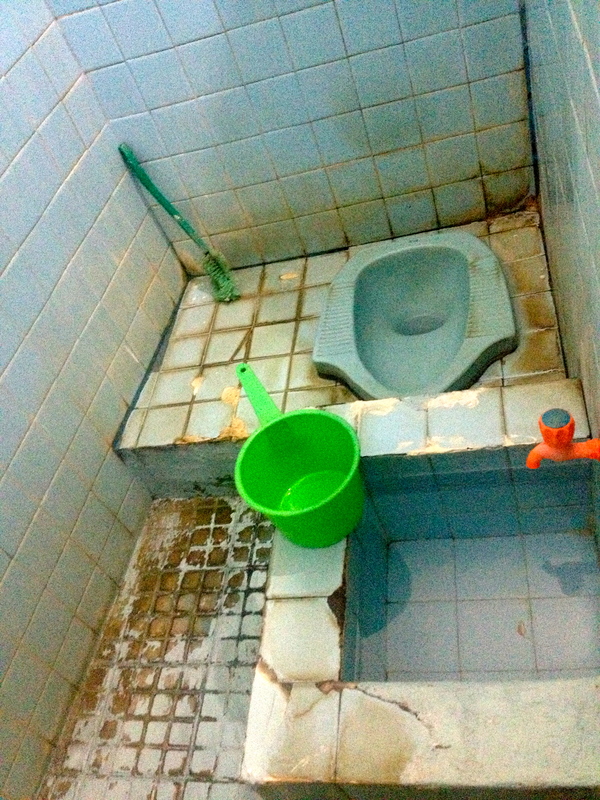 One container’s water is used for the toilet and the other for the mandi. You use a bucket to get the water from the container to your body to bathe. In this part, my Western rationale may be interfering with the logic of their ways, but considering running water is available – wouldn’t using a shower head/hose-like device be easier? the water used for showering. My clothes has probably fallen in there most times I mandi. Ironically, the only thing that’s safe is my waterproof iPhone. Random thoughts that occurred to me in the mandi: about how many buckets do I required for bathing? And touching the bucket used to flush the “toilet” must be the dirtiest thing in the bathroom. the bathroom…it’s not as bad as it looks. In Muslim culture, wet is clean. 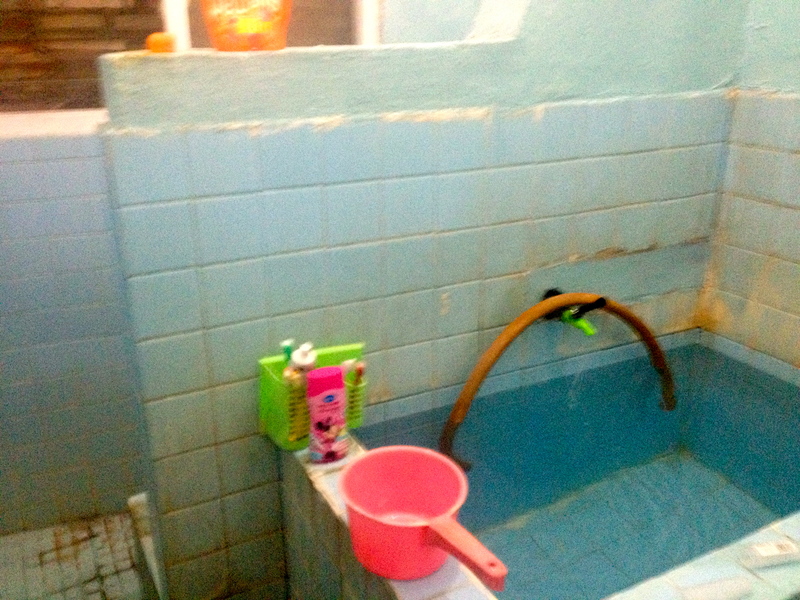 The kamar mandi is constantly wet and after using the bathroom, it is important that you splash buckets of water all over indicating it is clean. The days are so intense. It’s about a 10-minute walk to my class. It is mostly uphill but it is beautiful. I’m completely surrounded by volcanoes and mountains and since this town is primarily farms fruit and flowers, there are beautiful gardens everywhere. There are a lot of people out on the roads and I must stop and acknowledge all of them by saying Selamat Pagi! or Good Morning! In class, my teacher Hengky (who sounds and acts exactly like Rafiki from the Lion King) teaches bahasa Indonesian to me and 5 other volunteers, who are also living in my town. 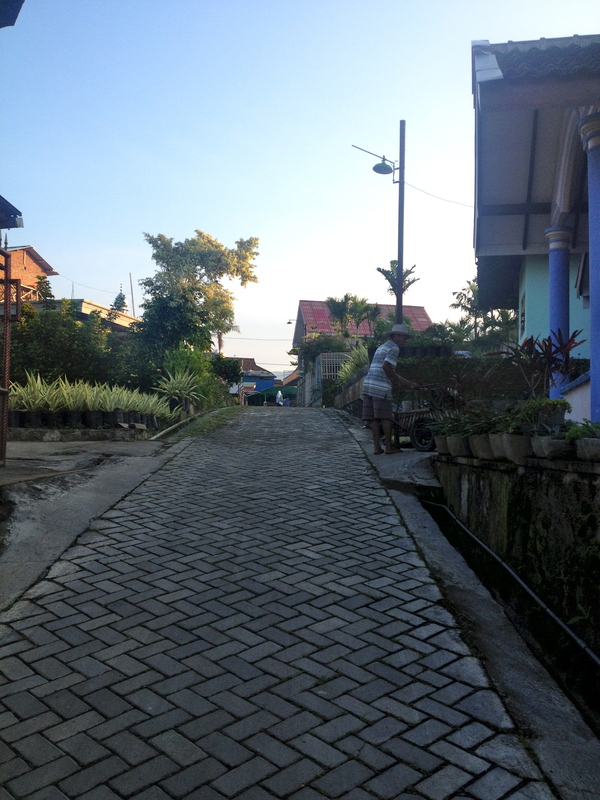 We learn bahasa Indonesian for about 6 hours a day and then we either go on walk or sit and talk with our cultural facilitator, Teghu, for 2 more hours. Here we get told what we are doing that may be culturally unacceptable such as using our left hand, sitting cross legged, wearing shoes inside, wearing sunglasses, putting on our shoes by putting our feet anywhere but on the ground and many other rules we are unknowingly breaking. We also ask Teghu about Islam and anything we can think of relating Indonesia. After this, I go home, mandi (as is required) and interact with my host family for the rest of the evening. It is exhausting. Most days I’m falling asleep by 9pm. Thankfully, bahasa Indonesian is a relatively easy language to learn, but even still I am extremely slow speaking it. Much less understanding when people speak to me. Although it’s only been a week, having a conversation with my host family is extremely difficult without a dictionary and writing things out. K, P, T, and D sound similar when spoken and I often miss the right consonant. Luckily, my host family is extremely nice and patient. I am closest to my host sister, Dina. She and her husband, Saipin, and their 4-year-old daughter Tashiah live in her father’s house— my bapak or “father” Sunamat and my ibu or “mother” Pipit. My bapak is a flower and apple farmer and my ibu is an apple seller. Dina is only a year older than me, but she’s definitely a mom. The first night I got here, she peeled an apple and handed me cut wedges. This morning, I had a problem with my dress and after 15 minutes of me trying, she was the one to fix it. She also brought me lunch in a pink lunch bag. Dina tells everyone I am her sister and Tashiah calls me Bibu or aunt Melanie. I think she’s actually a little jealous of all the attention Dina gives me. Poor kid. Everyone here already wants me to get married to an Indonesian and stay here forever. Dina has volunteered her brother and cousin so then we can be real sisters. I’ve managed to compromise that when my (real) family comes to visit, I will bring them to this house. With another volunteer, I learned about the game “Would you rather?” For example, would you rather encounter a snake or encounter a rat. I can’t help playing the game with myself asking myself: Would I rather use the Indonesian bathroom forever or eat Indonesian food forever? Of all the changes I’ve experienced, so far the hardest for me has been adjusting to the food and how much I am asked to eat. In an effort to not be rude, but mostly because activities are limited when there’s a language barrier, eating is constant. I am not a big eater and I don’t snack much or eat when I’m bored, but here I am asked to snack and eat constantly and the portions are huge, fried and filled with carbs and sugar. Last night my family literally gave me 5 cups of rice with potatoes, egg, tahu or tofu and vegetables. I did my best to take 6 big bites and I had to stop. If I keep this up I will gain 20 pounds by the end of training alone. Also, I’m not a fan of tempe. This is unfortunate for it’s almost as important as rice in the Indonesian diet. On second thought, the hardest thing to get used to are numbers in bahasa Indonesian. Apparently you have to be a math wiz to deal with rupiah and in order to tell time. For example, in English 20983 would be twenty thousand nine hundred and eighty three. In bahasa Indonesian, it is dua puluh ribu sembilan ratus delapan puluh tiga. In both languages saying the whole number is long, but at least in the U.S. you’re not dealing with thousands of rupiah on daily basis. Confirming that I received the right change is a luxury I can live without. The view from my classroom. …But this is definitely different. Life’s pace is much slower. These two weeks have been the longest of my entire life. Every thing feels brand new because every little thing is an ordeal. Showering, eating, even losing a key or finding a gecko in the kitchen sink requires 30 minutes of conversation and laughing because it takes that long to communicate. Back home, I spend a lot of time thinking about what other people may be thinking, but here I spend so much time thinking about the words I need to use in Indonesian that I don’t have the luxury to think about anything else. This has been refreshing. At the same time, I’ve had little time to do anything on my own. Back home, I listen to music pretty much all day, every day. Here, I’ve listened to music for about one hour in two weeks. This makes me feel like I’m losing an important part of myself for this experience, but perhaps this will improve in a few weeks. Also, since my communication is so limited with my host family, there’s only so much I can find out about them or tell them about myself. Therefore, although we live together, we know each other superficially. Perhaps, my Indonesian will improve enough so that I can attempt deeper conversations with my host family, but in reality we have done really well considering. Overall, this experience has been well worth the wait and difficulty. And that concludes week one. the volunteers in my village and I and Teghu, our cultural facilitator to my right. 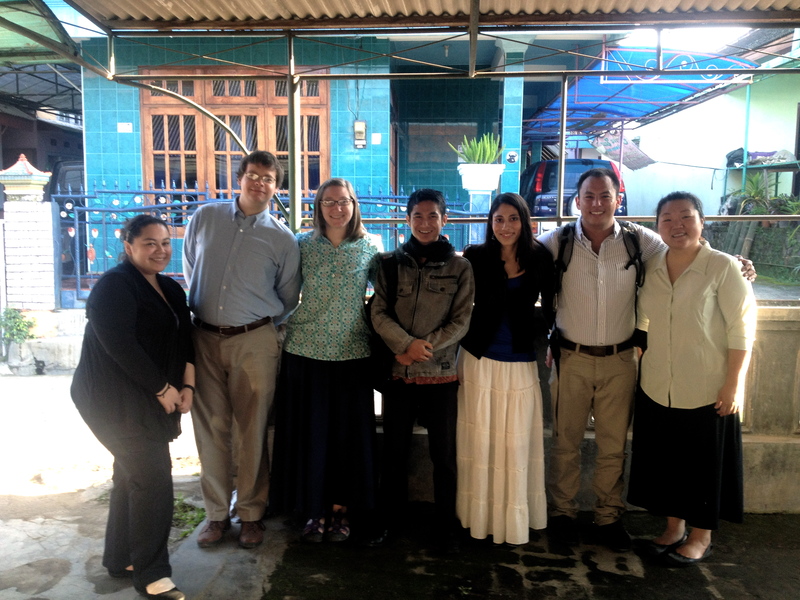 Tags: Indonesia, Malang, mandi, peace corps, Surabaya, teaching, training. Bookmark the permalink.